It’s that time of year again. The holiday season has arrived. After a brief, one-season hiatus due to moving to Ohio during the holiday season last year, I’ve gotten back to my annual tradition of designing a new holiday card based on my animal artwork. 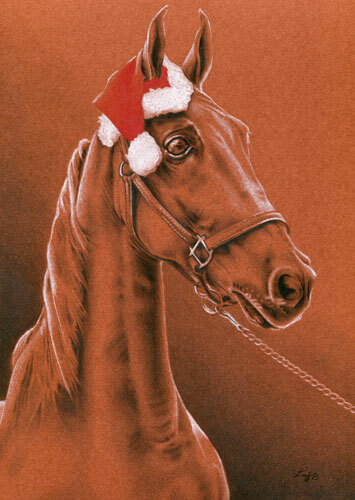 This year’s card features my beloved American Saddlebred gelding, Lucknow’s Clever Trick, posing in his Santa hat. The process of creating the card began with a photo shoot of Clever back in September. That allowed plenty of time to complete the illustration, design the cards and have them printed in time for the holiday season. Here are some of the reference photos of Clever, a glimpse of the process and some images of the final product.